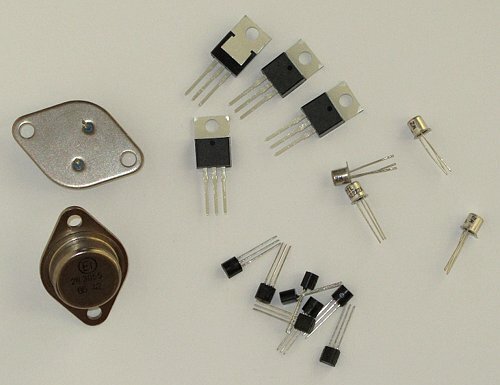 There are several kinds of transistors available, e.g. BJT, FET, MOSFET. Here the BJT (Bi-polar Junction Transistor) is discussed. There are two types of BJTs, namely NPN and PNP. Different packages have different names, e.g. TO-220, TO-18, etc. These are the names of the packages and not the transistor part numbers. The bigger the package is, the more power the transistor can handle. Each transistor has a part number. In the photo below, two different transistors are shown. They have the part numbers 2N2222 and KSP2222 (also available as PN2222). The 2N2222 is packaged in a metal can package known as a TO-18 package. The KSP2222 is an equivalent of the 2N2222 but is packaged in a plastic package known as a TO-92 package. Transistors have three pins called emitter (e), base(b) and collector(c). 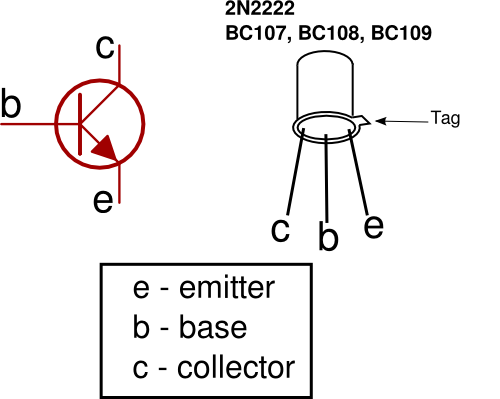 The way that a 2N2222, BC107, BC108 and BC109 transistor symbol maps to the physical device is shown in the diagram below. Different transistors (i.e. transistors with different part numbers) won't necessarily have the pins in the same order. This is especially true for transistors in the plastic TO-92 package. 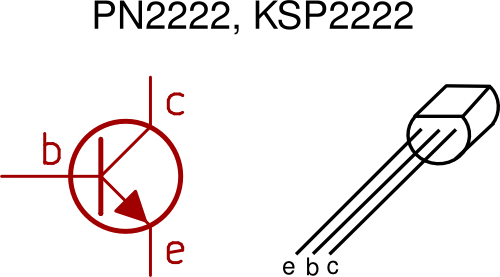 As an example, when the KSP2222 (or PN2222) transistor's flat side (the side with the part number printed on it) is facing you with the pins down, the pins are e, b, c (emitter, base, collector) from left to right. A different transistor's pins may be in the order b, c, e from left to right.